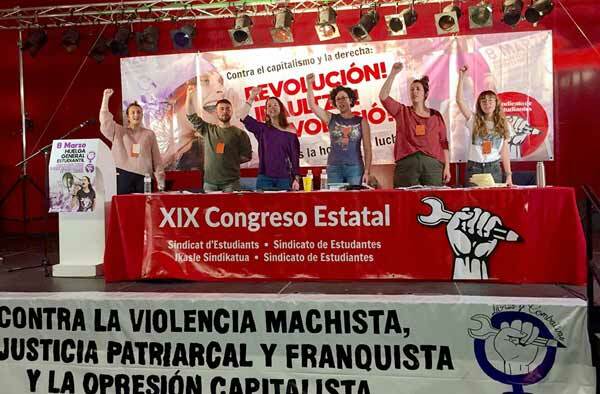 The call by ‘Libres y Combativas’ (a working class socialist feminist platform established by the Sindicato de Estudiantes and members of Izquierda Revolucionaria) to strike against sexist violence and in defence of the rights of working class women has brought out hundreds of thousands of students throughout the state. This is a historic strike, the first time ever that a strike of such dimensions has taken place on International Women’s Day. Mass assemblies and protests took place in more than one thousand schools and campuses. Hundreds signed up to get involved in Libres y Combativas, to strengthen the ranks of working class, anti-capitalist, revolutionary feminism.